You don’t want to spend hours answering questions about what to wear, when to show up, how to RSV, etc. from a hundred different guests - potentially coming from different places, near and far. Plus, it’s 2019. We’re getting all our other information from our phones and computers, so why not wedding details? Although you probably already know this by now, a wedding website allows you to put all of your wedding details - like your registry information, ceremony and reception location, and RSVPs in one place. It’s also a chance for you to tell your story to folks that don’t know you so well. A small amount of money can go a long way in turning a “good” wedding website into an “amazing looking” wedding website. Remember, this will be the first interaction your guests will be having with your wedding, and you want it to be engaging, visually appealing, and useful. Below are seven wedding websites that our ministers use and recommend, listed in no particular order. That’s because there really isn’t a one-size-fits all website. Your choice depends on how much time, energy, functionality - and money - you want to dedicate to this part of your wedding. The Knot offers a free package (you can purchase a custom domain for $20) with over 160 beautiful designed templates. Their site comes with a myriad of planning tools and also syncs to all of your registries. It is one of the most well-rounded and popular free wedding website services around. The Knot is obviously one of the biggest wedding planning registries in the industry, and a lot of wedding service providers use it as well. 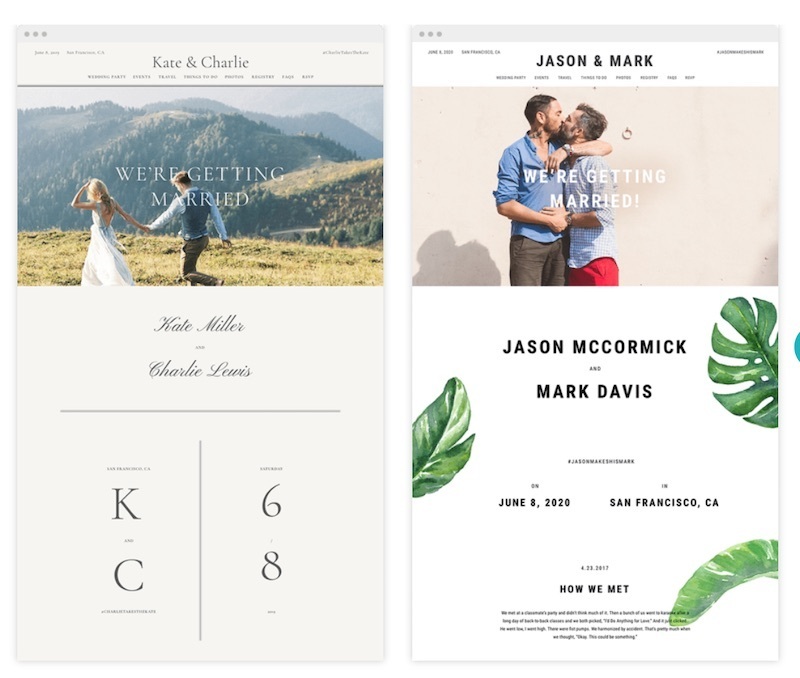 The details for this wedding site service might change pretty soon since it was announced last year that the parent company of The Knot is going to acquire WeddingWire for a whopping $933 million, creating one of the biggest media and planning companies in the wedding world! That said, WeddingWire has some pretty awesome features, and offers easy-to-use wedding website templates. The service is free with an option to purchase a custom domain for $13. There are over 400 template options to choose from and their website integrates well with other digital planning tools. Pages can also be hidden or password protected. Although there are many templates to choose from, we found that a lot of their choices lack the “wow” factor. It does, however, offer the essentials that a wedding website needs - but without the flare. If you want a good selection of functionality, and you don’t mind paying a few extra bucks to get the look you really want, this option is a good choice. 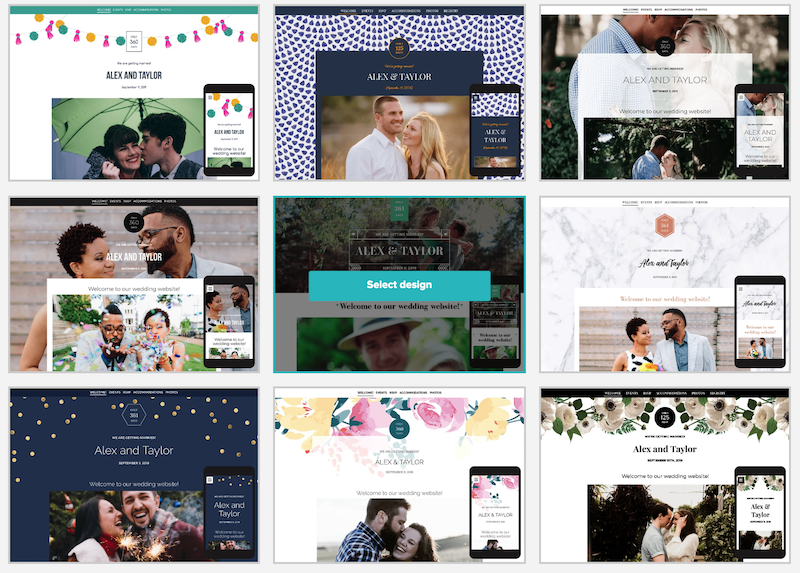 You probably didn’t think of Squarespace as a “wedding website” but it’s actually one of the more versatile options! If you are a techy or into design and want customization, this is your best choice short of coding your own site. The customization is very intuitive and your site will look professional - you can even have it password protected if you wish to keep your wedding details hidden from the general public. That said, there are no special features for wedding needs, so setting up RSVP and registry features can be a bit of a challenge unless you are tech savvy and know some workarounds. There are also features you won’t really need, like blogging and e-commerce. Squarespace offers a month-to-month plan for $16/month or $12/month for 12 months. A custom domain will also set you back $20 or more. Wix is more affordable if you are looking for a customizable site. There is a free option, but with that comes a large “Wix” banner at the top of the site. This is your wedding, though, and the less corporate logos, the better. There is a premium service for $10/month which comes with a free custom domain. 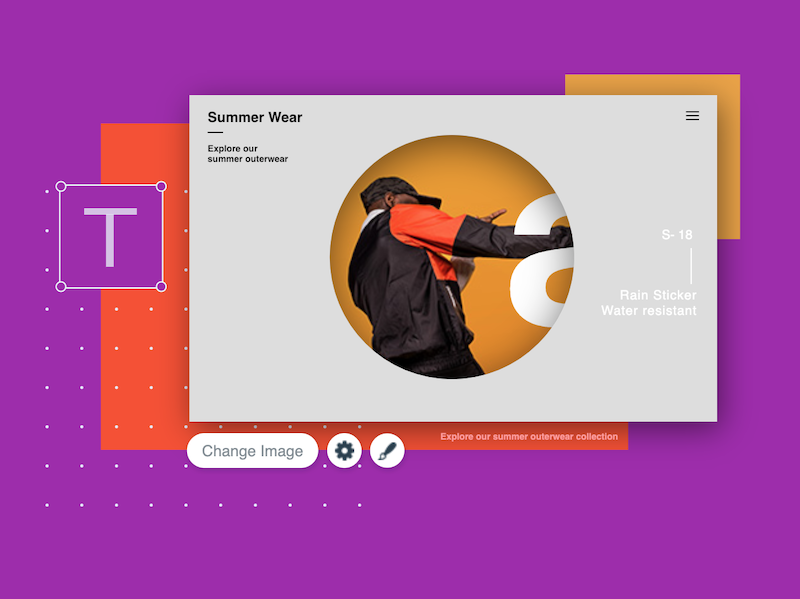 The layouts are eye catching, and the drag and drop layout is easy to use. You can password-protect your whole site, or just specific pages (like your RSVP or pages with venue addresses). It does, however, lack guest list tools and registry features, so this is best suited for couples with web development experience. This is a service geared to couples that want a truly elegant looking website. Everything is highly customizable with numerous features - including the option for guests adding to submit song requests for your reception playlist. Like most pretty things, this option isn’t cheap ($35/month) and it does require a hefty investment of your time to establish your site and its features. But if you are looking for a trendy, beautifully designed wedding site, this is the one that will surely impress. What that basically means is that in addition to a full suite of digital and paper planning options, these folks will give visitors the sort of landing page experience you might expect from a hipster media company. All-in-all, this one is worth checking out, because they seem to have their finger on the pulse of what’s hot in weddings. Even if you don’t go with Riley & Grey, you still might find inspiration. If you ever wanted your own app, your wedding might provide the perfect opportunity to create one! The Appy Couple designs are modern and fun, and the features are interactive. There are options to RSVP, directly message guests, and even invite select guests to pre-wedding events. But besides the price ($49 for the boutique option and $149 for the luxury service), the biggest drawback is that you are forcing your guests to download another app. Some might jump at the chance, while others will groan or just skip it altogether. So unless you know your guests will be 100% on board with downloading and interacting with your app, this may not be the most worthwhile or cost-effective option for you. If you are a young couple expecting high-end gifts, you are most likely thinking about using Zola as your registry. Zola also offers an easy-to-set-up wedding website for free at $14.95 for a custom domain. The guest list feature is top notch and you can make any event private, which means only invited guests will see it. The downside? There are only around 30 templates, and if you are not using Zola as your registry it can feel quite limiting. There is no way to integrate with other sites and tools, so your guests are out of luck if they are looking for information about nearby hotels. In conclusion, we found aspects of all the sites that appealed to us depending on the feel, tone, and need for additional features. But rather than directing you to one or another site, we hope that this wedding website summary helped you start thinking about what you want from a wedding website, and where to start looking. Let us know what you think, and we welcome your input at [email protected]!